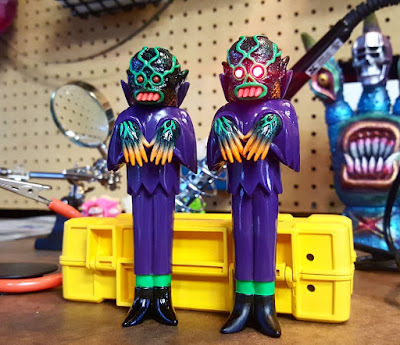 Later today, Justin Ishmael will be offering two insane new painted editions of Craig Gleason’s The Ghoul vinyl figure! Justin really killed it on both the glow in the dark Ecto-Glow Edition and the purple and green Grave Digger Edition (inspired by the iconic monster truck). But what’s really cool about this release is that there’s an insane Light Up Eyes Grave Digger Variant!!! Each figure is cast in soft Japanese vinyl, stands 5” tall and features 3 points of articulation (head and hands). The Ghoul Ecto-Glow Edition retails for $60, The Ghoul Grave Digger Edition retails for $60, and the Light Up Eyes The Ghoul Grave Digger Edition retails for $100. Justin is also releasing both colorways in an unpainted edition – glow in the dark or purple – for just $35 each. All five colorways will go on sale at at 9am PST today, Friday, March 16th, at JustinIshmael.com.